Professional makeup artist Erica Abdo of Green Beauty Bliss TV has worked with celebs such as Samantha Harris and helped get models runway-ready at New York City’s Fashion Week. She’s shared her expert beauty tips for national magazines such as Shape and Redbook. 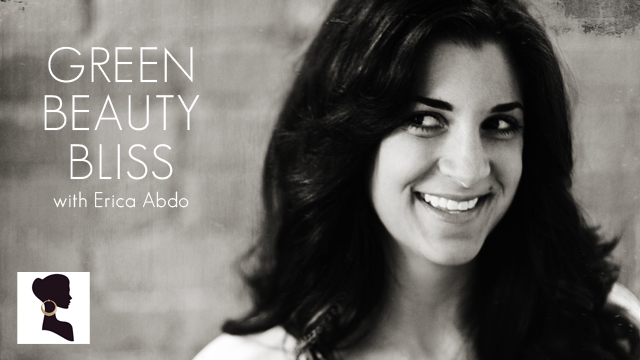 Erica has paired the worlds of beauty and wellness to launch her own green beauty studio in Syracuse, New York. Passionate about health, Erica focuses her talents and personal ethics on educating people on choosing the best organic skincare and cosmetic products, all while offering unique holistic services, such as organic facials and spray tans, that keep her clients feeling beautiful inside and out. 8AM: I wake up and begin my day by making a delicious green smoothie (spinach, kale, cilantro, spirulina, wheat grass, maca powder, chia seeds, an apple, lemon and ginger)! I get a rush of energy that fuels me until lunch. Feeling calm and clearheaded, I’m ready to sit at the kitchen table and respond to my emails. 10AM: I go to a CrossFit class. I love that these workouts are always changing. One day I’m jumping rope and doing handstand pushups, and the next I’m doing lifts heavier than I ever thought possible. This class has helped me achieve excellent posture, stamina, strength, flexibility, coordination, and balance. 12PM: I am just finishing up my infrared sauna session at my studio. I love the infrared sauna because I get detoxification, muscle relaxation, and skin rejuvenation all at the same time! This is my 45 minutes to just relax and give gratitude for all the incredible opportunities that have evolved in my life. 3PM: I am at my favorite place (my studio) doing what I love to do!! I’m either ‘working’ (though I never really feel like I’m working) in my makeup room, spray-tanning room, or facial/ waxing room. Anything you put on your skin soaks into your bloodstream and that’s why I choose to use organic/all natural products for all my services. 5PM: I’m educating customers on the latest products in my Green Beauty room at my studio, which showcases all of my favorite hand-picked organic/all-natural makeup, skincare, body care, hair care, nail care, and fragrances. I have adorable glass water bottles and organic gluten-free and dairy-free chocolate too (who doesn’t love chocolate?)! This room means the world to me because it’s a place where my clients can come and purchase beauty products without having to worry if they will harm them. 8PM: This is my time to make an incredible dinner, always consisting of an extravagant salad first to aid in better digestion. I strive to eat 85 percent alkaline-forming foods and 15 percent acid-forming foods to look and feel my best! The only foods on earth that leave an alkaline residue in the body are fresh, ripe fruits and vegetables. It truly has helped me maintain my weight and improve my overall health and beauty!